APF International’s investment management is characterised by a proactive and committed approach. We know what our investors want and we combine knowledge with commercial instinct. We work flexibly by responding quickly, practically and creatively to the wishes of our clients, with all the requisite personal attention, from purchasing to selling. Respected investors trust APF International for the outsourcing of their investment management due to our long record of service combined with our broad range of services and our company’s vision. A joint venture between APF International and Angelo, Gordon & Co, we acquired the vacant office building in 2015 with the aim of transforming it into a high-end and sustainable (BREEAM Very Good) office building. The building, of approx. 6,300 m², dates back to 1880 and has undergone several renovations over the past few years. The last addition, a façade from the year 2000, has been completely replaced by a façade designed by Cruz y Ortiz Architectos (of Rijksmuseum fame, among other things). In addition, the entire interior and installation work has been replaced and the existing patio has been closed. Peak Development supervised the redevelopment on behalf of the client. On 1 September 2017, the American software company Oracle moved into its new “Cloud Center”. Approximately 400 people are now working in the building. In accordance with the purchase objective, the joint venture sold the building to TH Real Estate in December 2017 for more than €50 million. A joint venture between APF International and Angelo, Gordon & co, acquired the office building 'Y-Point' in early 2017. The building of approx. 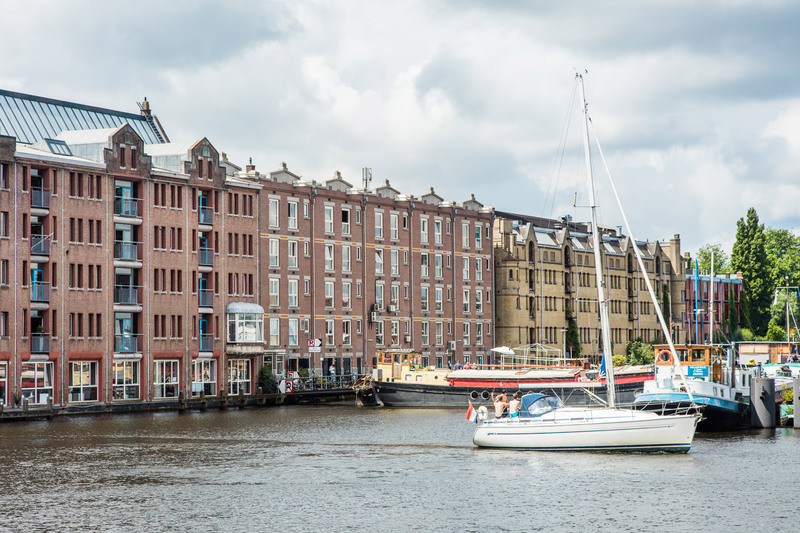 7,200 m² lettable floor space is located on the Van Diemenstraat in the Old Houthavens in Amsterdam. The purpose of the purchase is to redevelop this building (originally a warehouse built in 1913) while retaining its existing use as an office. The lack of a relationship with the water is evident in its current state. The corridor structure installed at the end of the 1980s completely broke the warehouse feel. It is important return to the essence of the building. Sustainable renovation would be an answer to the demand from the city and the market to provide high-quality office space. Value and quality will therefore be added to the floor space (+ 800m² lettable floor space). Meanwhile the renovation plans have been developed and the renovation will start in mid-2018. After the renovation, “Y-POINT” will be characterised by optimal conditions for light, ventilation, acoustics, visibility and flexible use. There will be more unity in the complex as a whole and more individual recognisability. Een joint venture tussen APF International en Ares Management verwierf het kantoorgebouw “Le Six” eind 2015 als onderdeel van een Europese kantorenportefeuille. The building of approx. 6,800 m² lettable floor space is located on the Gooimeer in Naarden, alongside the A1 motorway. The reason the portfolio was purchased was to add value to the buildings and to sell them upon successful completion. When the office building was acquired, approximately 25% of the area was available for letting and the remaining lease term for all leases was still very short. In order to set up new leases and to extend leases, it was necessary to give the building and general areas a new ‘look and feel’. APF, together with DZAP architects, extensively renovated the entrance and invested heavily in several office floors. Within a period of 18 months, all the vacancies were filled in, all existing leases were extended and the renovation of the office floors and the entrance took place. The building was successfully sold at the end of 2017. A joint venture between APF International and Ares Management acquired the "Le Six" office building at the end of 2015 as part of a European office portfolio. The building of approx. 7.350 m² lettable floor space is located on the Watermanweg in Rotterdam Alexandrium. The purpose of the purchase of the portfolio was to add value to the buildings and to sell the buildings upon successful completion. When acquiring the office building, more than 20% of the area was available for letting. The entrance of the building had a dated look with dark colours and lots of natural stone. APF, in collaboration with DZAP architects, renovated the entrance and lent it a new contemporary look with light colours and natural materials. APF also renovated the vacant floors. Before the building was successfully sold at the end of 2017, APF substantially reduced its vacancy by attracting 2 new tenants and extending the lease contracts of the three largest tenants.